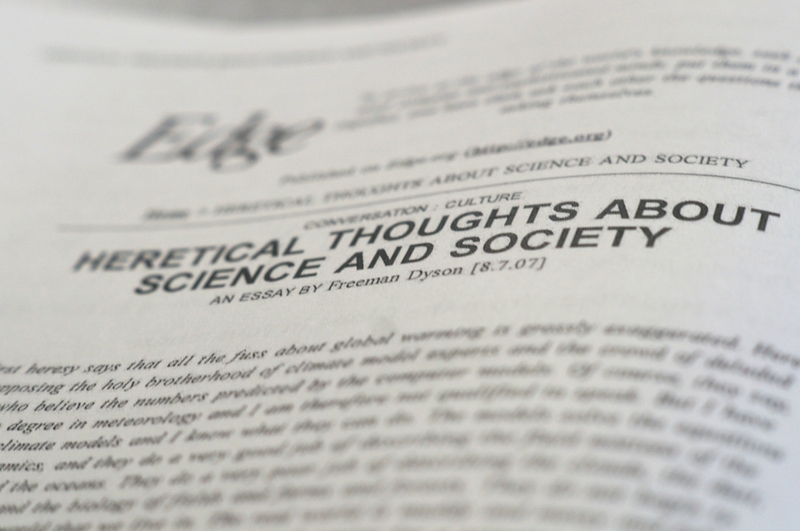 English professor Ken Hiltner’s new course, “The Rhetoric of Climate Change,” studies the climate change debate by analyzing popular narratives on all sides of the argument. Ken Hiltner, right, a professor of English and of environmental studies, is also executive director of UCSB’s Environmental Humanities Initiative. 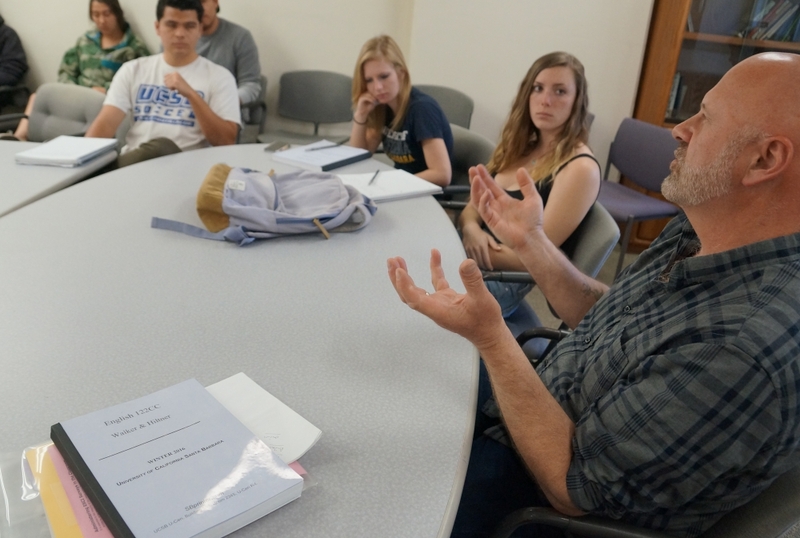 In a unique offering believed to be the first and only university course of its kind, UC Santa Barbara English scholar Ken Hiltner has created and launched a class examining climate change through the lens of literature. “The Rhetoric of Climate Change,” which just wrapped its inaugural quarter, studies the climate change debate — Is it real? Is it manmade? Can it be fixed? Should it be? — by analyzing popular narratives on all sides of the argument. Take Shakespeare’s use of narrative in “Othello” to simultaneously enamor readers with Desdemona and seed disdain for Iago. The writers of so-called climate change “denial literature,” according to Hiltner, employ similar strategies with similar success. Of the 25 students in this inaugural seminar, most, Walker and Hiltner concurred, were definitely on board with the idea that climate change is real and anthropogenic. Yet they also were decidedly enthusiastic about the opportunity not only to read opposing views, but to analyze and understand them. Across the board, students from the class attested to the importance of accepting diverse beliefs as a way toward solutions. What they did was the critical examination that is at the heart of the humanities, by way of good, old-fashioned reading and writing. Hiltner and Walker identified the most prominent “denialists,” as such folks are colloquially known — S. Fred Singer, for example — and asked the students to read their most popular pieces. They tossed in key voices from the other side of the spectrum as well, such as author/activist Naomi Klein. Their framing document for it all: The latest comprehensive climate-change assessment report from the Intergovernmental Panel on Climate Change (IPCC). 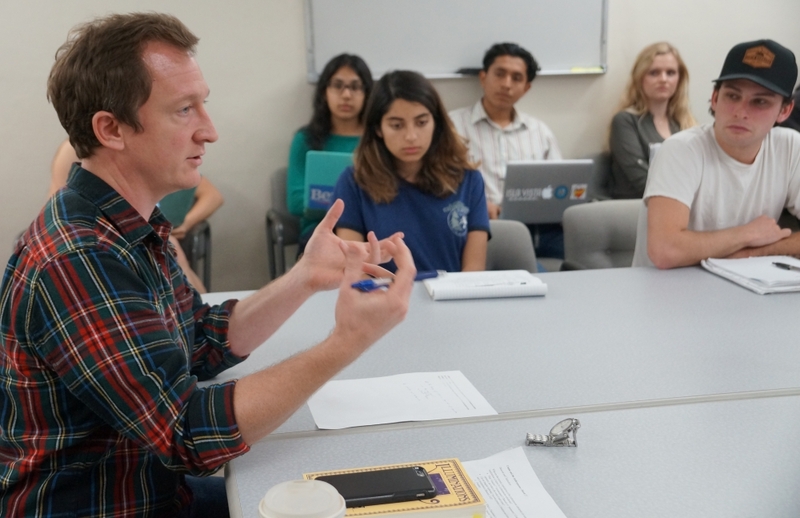 “I don’t know anyone who wants to sit down and read the IPCC report, but it is important to do so,” said Hiltner, who was UCSB’s 2014-15 Sustainability Champion. “If nothing else, you walk out of this class seeing the many sides of what I would argue is one of the most important issues — if not the most important issue — of this century. His belief in the powerful role that the humanities can play in addressing such global concerns was enthusiastically affirmed, Hiltner said, by the course and by the engaged, enthusiastic response from students. At a time when, according to a national study recently published in the journal Science, one in three U.S. public school educators is teaching climate-change denial, it’s coming none too soon. Student Edward Friedlander, a graduating senior who will earn a bachelor’s degree in English, put it this way: “You can have climate research and science pertaining to climate change, but it’s useless if you can’t enter into dialogue with people who don’t accept that science. What this class does, uniquely, is allow us to investigate modes by which we can both infiltrate that discussion and help carry it out.